The Hmong Fellowship Church (HFC), a Christian church body in Vietnam that had been without trained pastors for 50 years, has become an unexpected and amazing opportunity for the spread of the gospel. In 2013, leaders of the HFC heard a grace-filled sermon from WELS Pastor Bounkeo Lor over the Internet. They were intrigued and invited Rev. Lor to come to Vietnam to train church leaders. The pastors of the HFC recognized that, for the first time, they were learning biblical truth and the true meaning of the gospel. They asked for more training, wanting their church body to be fully instructed in Lutheran doctrine. Rev. Lor, who now serves as the Hmong Asia Ministry coordinator, has made repeated trips to Vietnam in the years since, training over 60 leaders of the HFC. That was amazing enough. Since instruction began, the HFC has grown from 65,000 to 100,000 members. And even more amazing, the communist government of Vietnam has expressed its approval and support for this training. One government official has commented that, of all the Christian churches working in Vietnam, WELS is the only one that is teaching what the Bible says. The government has invited our synod to construct a building that can serve as the center for this expanded training. Building a new facility will allow the HFC more freedom to schedule training for its leaders. It will give students, who live mainly in rural areas far from Hanoi, a place to stay when attending classes. And it will provide worship space for local Hmong to attend services. Representatives of the Board for World Missions are working diligently to iron out the details of the property acquisition and the construction of the training center. While we recognize that there is risk in making this commitment, there is full agreement that this is a God-given opportunity that should be seized. Learn more about opportunities in Vietnam and how you can support the effort at wels.net/vietnamhmongoutreach. One highlight of this year’s convention was the keynote presentation by Rev. Kirk Massey and Rev. Gary Lupe, Apache pastors who told attendees about the 125 years of God’s grace during which WELS has been sharing God’s Word on the Apache reservation. As Massey presented the history of the mission field, Lupe entertained the audience with stories from his life and ministry. To learn more about how WELS is celebrating the 125th anniversary of its work on the Apache mission field, visit nativechristians.org. Missionary wives led a workshop about the ministries in which they serve. 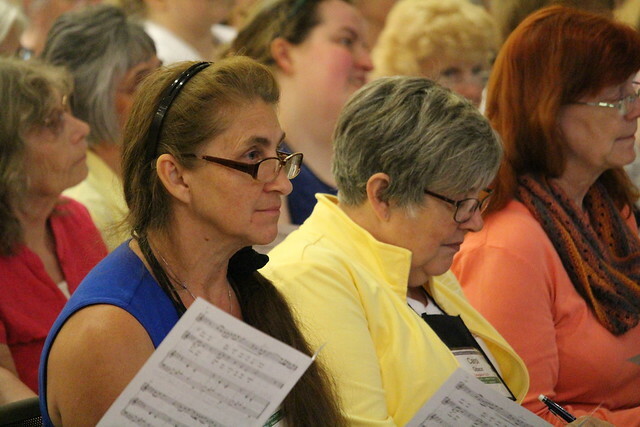 Attendees marveled at the ways that God is using these women. For information on the 2018-19 mission projects and to learn more about the 2019 LWMS convention being held in Des Moines, Iowa, from June 27-30, visit lwms.org. To view recorded sessions from the 55th annual LWMS convention, go to livestream.com/welslive.